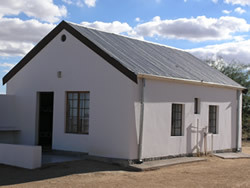 The White House, located near Grunau, Namibia, was built in the early 1900s, between 1912 and 1915. 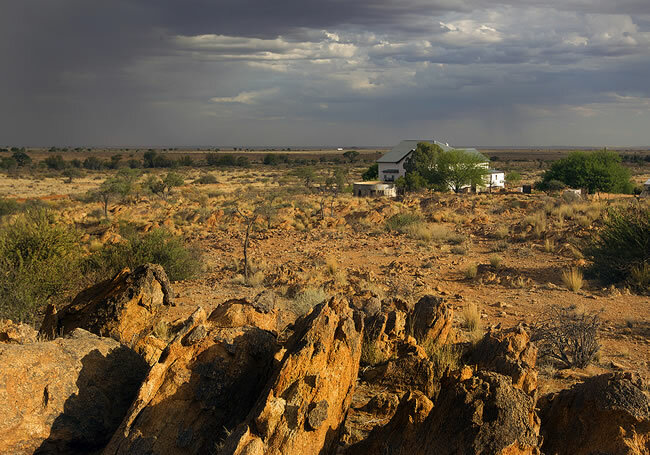 This beautiful house is situated on a 15,000 hectares farm in the far south of Namibia, 11 km north of Grunau on the national road B1, the main road from South Africa to Windhoek. White House is 125 km from Ai-Ais Hot Springs and 115 km from great Fish River Canyon. 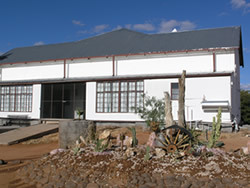 The White House is often used as a base to make a day trips to both Ai-Ais Resort and Fish River Canyon. You are invited to come and enjoy the wide open spaces, the peace and tranquility of southern Namibia, the beautiful sunsets and the millions of bright stars at night. The White House is an affordable, clean and comfortable, halfway stop between Cape Town and Windhoek offering great meals. Wi-Fi Internet is available. In 1912 Frederich Haschke bought the farm Mickberg (15 000 hectares) for 2 500 Pounds. It was then known as the waterless farm. He immediately started building a house for Martha Feiber, his wife to be. 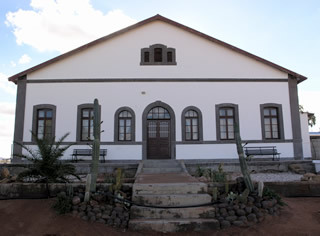 Building material for the house was imported from Germany to Luderitz Bay, from where it was railed to Klein-Karas Station. A steel tyred wagon was used to transport the material from Klein-Karas station to the farm. Water needed for building the house was transported from the neighbouring farm, Grabwasser. There is no information on how long it took to complete the house, but after all the trouble of building the house for his bride, to his greatest disappointment, he still could not find any water on the farm. 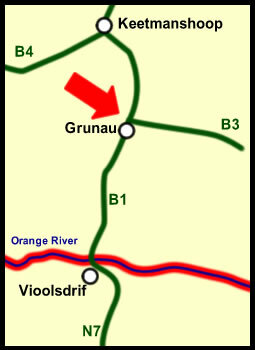 When the First World War broke out, troops from the Union of South Africa invaded this German colony. In April 1915 the young couple, who were pursued by troops, fled to the north of the colony with some of their possessions and live stock. The White House was left behind, furniture and all. Their flight was cut short when they were arrested on the 17th of April and all their possessions were confiscated. Frederich was sent to a prisoners-of-war camp at Kimberley and Martha was kept prisoner at Gibeon. All the adversity was too much for Frederich. He was declared temporarily insane and sent to Falkenburg, a mental hospital in Cape Town. In 1918 he was sent back to Germany, where he was reunited with his wife. In 1927 two Swanevelder brothers, Jan and Piet from Colesberg, were looking for farmland in southern South West Africa. 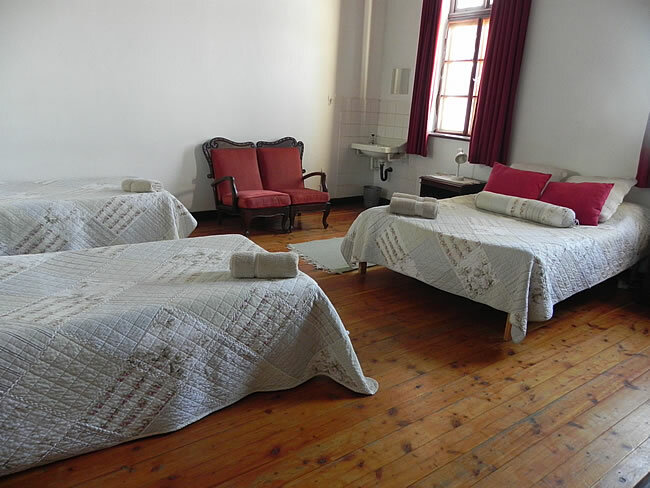 They stayed over in the Kalkfontein Hotel in Karasburg. There they learned that the farm Mickberg was for sale. 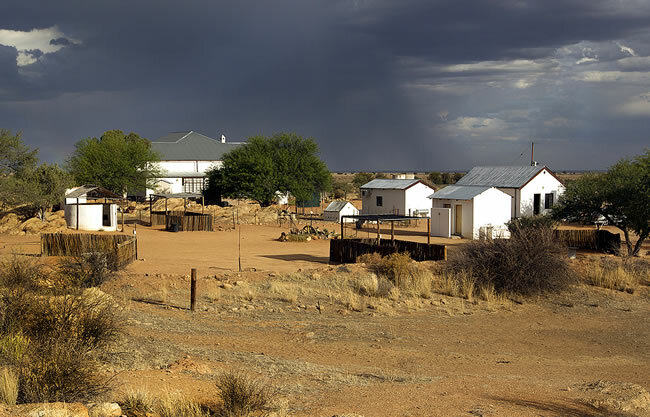 Through attornies in Keetmanshoop they negotiated with Frederich in Germany and eventually bought the farm for 3 500 Pounds. They were fortunate in finding sufficient water in due course. This is the farm where the young miss Febe Swanevelder then grew up. Quite soon Dantie de Wet, foreman on the neighbouring farm Signalberg, started to court the lovely young lady Febe. 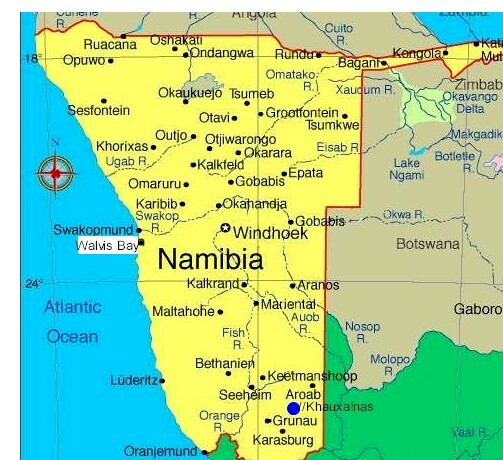 The great drought in 1933 forced Piet and Jan Swanevelder to move their merino flock to Namaqualand, while Dantie had to trek to the vicinity of Kalkrand to find grazing for the karakul flock of Signalberg. The womenfolk had to stay behind and look after the farm. Febe had to walk to Signalberg (about 7 km) every second day, to look after the windmill and water the vegetable garden. Should they run out of groceries, she had to walk 14 km to Grunau, (about 14 km) to exchange eggs for their necessities. Febe also had to swop eggs for a postage stamp to be able to send a letter to her sweetheart. In 1934 Dantie and Febe were married in the White House. Some time later, Dantie bought one half of the farm Mickberg. Dantie and Febe had four sons: Gideon, Pieter, Francois and Rudolf. After they retired, Rudolf continued farming – he is now the third generation on Mickberg. Once again the White House was the honeymoon-house when he married Kinna (Smit) in 1978. They have been blessed with 3 children: Dolf (junior) is married to Nita (Vosloo); Niekie is married to Albert van der Merwe of Noordoewer; and last but not least Febe, who is still at university in Stellenbosch. The White House formally opened it’s doors as a guest house in 1998, and in 2012, celebrated it’s centenary. So the original vision of Frederich Haschke for a new life, happiness, love and other festivities lives on! There is a well stocked fridge in the kitchen with cold beer, wine and soft drinks. Tea and coffee are also available in the kitchen. Main building is fully equipped with modern amenities, and each room and chalet has its own private shower and toilet facilities. There is a well stocked fridge in each chalet with cold beer, wine and soft drinks. A kettle with coffee and tea is available in each chalet. 2 x chalets with double bed + 2 bunker beds and en-suite bathroom. 1 x chalet with 2 single beds and en-suite bathroom. 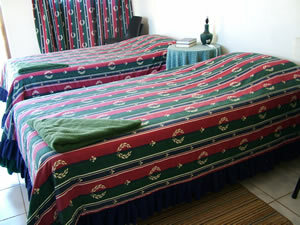 All the mentioned rooms are equipped with a fan for the summer and a heater for the cold winter nights. The White house is fully equipped from bedding, towels, cutlery, toaster, kettle, tea, coffee, and sugar. Every room has a well stocked fridge with cold beer, wine, soft drinks and ice. At White House you are allowed to self-cater, but White House is also well-known for their home-cooked meals. White House serve dinner, breakfast and a braai-pack for the people who prefer to braai (barbecue) themselves. or the kitchenette of the chalet. Hosts also supply the wood and grid. Guest farm is connected to the main power supply, NamPower for those who need electricity for a fridge, and other appliances. Night drives: take a night drive to see the nightlife. Bird watching: there are 50 plus different species for bird enthusiasts recorded in the area. Watch these near drinking place or in the open veld. Succulent trip: The “Mickberg-gensis” a sub specie of the Karas Montana, is unique to this farm. This trip and finding Lithops, is an experience of a lifetime. Dolf will make sure that you look in the right areas to find them and to see where these little plants grow in their normal habitat. Lithops and other succulents: lithops grow in very dry desert areas with the stems buried in the stony dry earth and only the tips of the stems are visible. Most Lithops have intricately patterned tips to the leaves which make them look like stones, this is why they have the common name of living stones. Game drives: watch Springbok and Gemsbok (Oryx) close up. Rose quartz mine: if you are interested in semi-precious stones then you must visit local rose quartz mine. The Rose Quartz is a pink variety of Quartz that occur in large translucent masses. It is never transparent, and it does not form crystal faces or crystals. Rose quartz occur at many pegmatite locations all over the world. 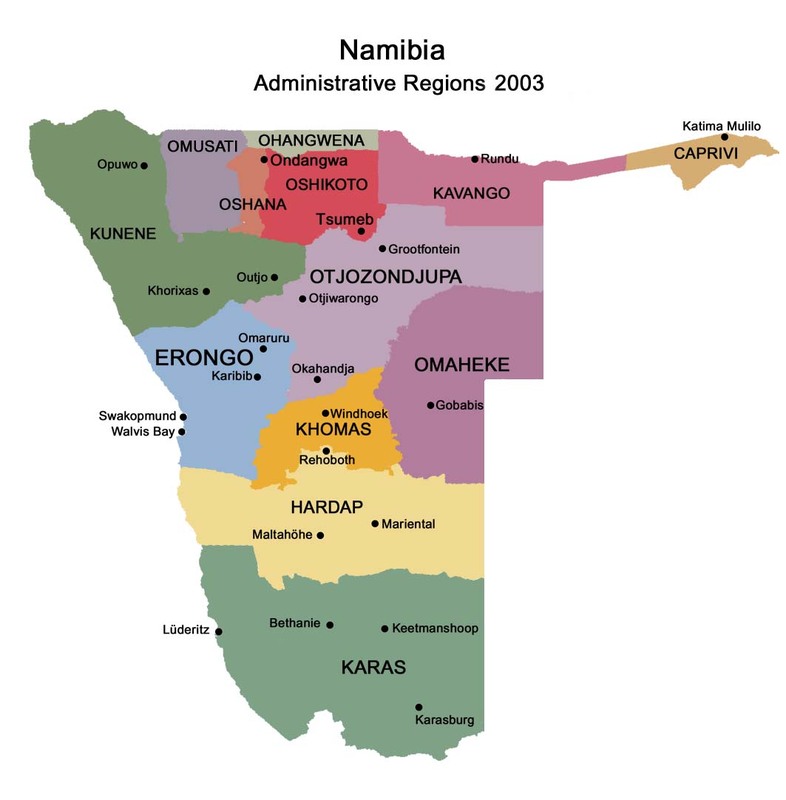 It's Namibian origin is from the Rossing Mountains near Swakopmund. We are fortunate to have a small Rose Quartz quarry on our farm. People interested in semi-precious stones are welcome to visit the quarry on prior booking. Trips to this quarry will take between 2 to 3 hours. At the reception we display rough and polished pieces as well as unique hand-made jewellery by Kinna. The rose quartz jewellery consists of ear-rings, bracelets, key-rings, necklaces, eggs and tumbled pieces. Tourists and guests are welcome to visit and buy some of these unique items, a true Namibian souvenir.